This page provides examples of MLA-, Chicago-, and APA-style citations for a journal article retrieved from a subscription database. Lastname, Firstname. "Article Title." Journal Title vol. #, [issue] no. #, year, pages. Database , doi:000000/0000000000. Renfroe, Alicia Mischa. 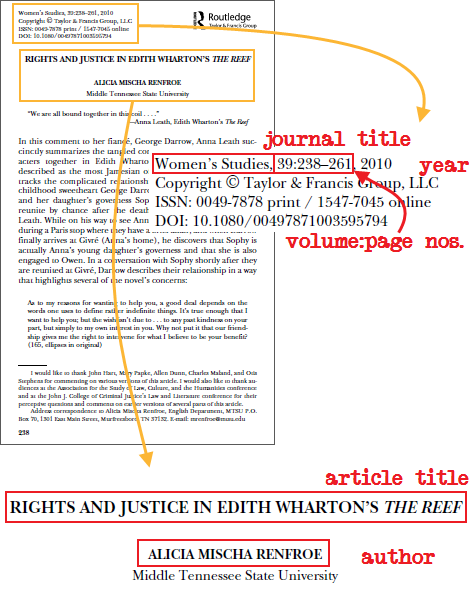 "Rights and Justice in Edith Wharton's The Reef ." Women's Studies vol. 39, no. 3, 2010, pp. 238-261. Literary Reference Center Plus , doi:10.1080/00497871003595794. Lastname, Firstname. "Article Title." Journal Title , volume, no. issue (year): pages. Database (accession number). Renfroe, Alicia Mischa. "Rights and Justice in Edith Wharton's The Reef ." Women's Studies 39, no. 3 (2010): 238-261. Literary Reference Center Plus (48643829). #. Firstname Lastname, "Article Title," Journal Title volume, no. issue (year): pages, Database (accession number). 2. Alicia Mischa Renfroe, "Rights and Justice in Edith Wharton's The Reef ," Women's Studies 39, no. 3 (2010): 242, Literary Reference Center Plus (48643829). 5. Renfroe, "Rights and Justice," 248. Renfroe (2010) argues … (pp. 251-52).